Want some volcano facts? Here are 10 interesting facts about volcanoes. Some of these facts you’ll know, and others may surprise you. Whatever the case, volcanoes are amazing features of nature that demand our respect. Although volcanoes are all made from hot magma reaching the surface of the Earth and erupting, there are different kinds. Shield volcanoes have lava flows with low viscosity that flow dozens of kilometers; this makes them very wide with smoothly sloping flanks. Stratovolcanoes are made up of different kinds of lava, and eruptions of ash and rock and grow to enormous heights. Cinder cone volcanoes are usually smaller, and come from short-lived eruptions that only make a cone about 400 meters high. About 30 km beneath your feet is the Earth’s mantle. It’s a region of superhot rock that extends down to the Earth’s core. 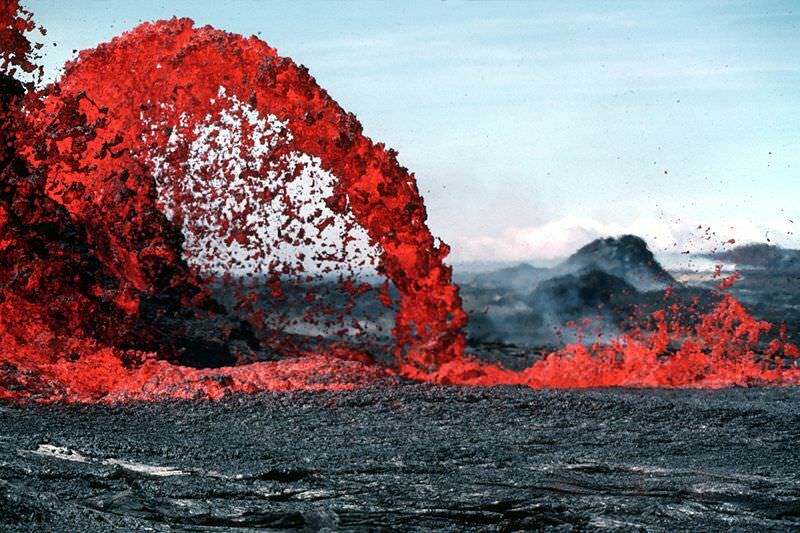 This region is so hot that molten rock can squeeze out and form giant bubbles of liquid rock called magma chambers. This magma is lighter than the surrounding rock, so it rises up, finding cracks and weakness in the Earth’s crust. When it finally reaches the surface, it erupts out of the ground as lava, ash, volcanic gasses and rock. It’s called magma when it’s under the ground, and lava when it erupts onto the surface. An active volcano is one that has had an eruption in historical times (in the last few thousand years). A dormant volcano is one that has erupted in historical times and has the potential to erupt again, it just hasn’t erupted recently. An extinct volcano is one that scientists think probably won’t erupt again. Here’s more information on the active volcanoes in the world. Although some volcanoes can take thousands of years to form, others can grow overnight. For example, the cinder cone volcano Paricutin appeared in a Mexican cornfield on February 20, 1943. Within a week it was 5 stories tall, and by the end of a year it had grown to more than 336 meters tall. It ended its grown in 1952, at a height of 424 meters. By geology standards, that’s pretty quick. Somewhere, around the world, there are likely about 20 active volcanoes erupting as you’re reading this. Some are experiencing new activity, others are ongoing. Between 50-70 volcanoes erupted last year, and 160 were active in the last decade. Geologists estimate that 1,300 erupted in the last 10,000 years. Three quarters of all eruptions happen underneath the ocean, and most are actively erupting and no geologist knows about it at all. 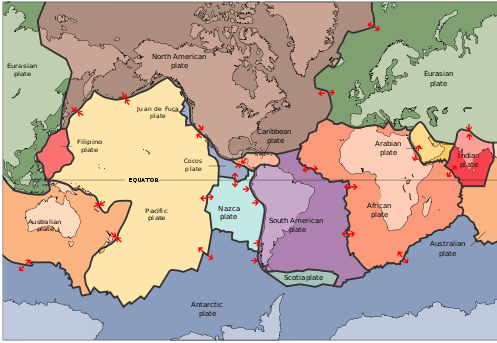 One of the reasons is that volcanoes occur at the mid ocean ridges, where the ocean’s plates are spreading apart. If you add the underwater volcanoes, you get an estimate that there are a total of about 6,000 volcanoes that have erupted in the last 10,000 years. But then you knew that. Some of the most deadly volcanoes include Krakatoa, which erupted in 1883, releasing a tsunami that killed 36,000 people. When Vesuvius exploded in AD 79, it buried the towns of Pompeii and Herculaneum, killing 16,000 people. Mount Pelee, on the island of Martinique destroyed a town with 30,000 people in 1902. The most dangerous aspect of volcanoes are the deadly pyroclastic flows that blast down the side of a volcano during an eruption. These contain ash, rock and water moving hundreds of kilometers an hour, and hotter than 1,000 degrees C.
Geologists measure volcano eruptions using the Volcano Explosivity Index, which measures the amount of material released. A “small” eruption like Mount St. Helens was a 5 out of 8, releasing a cubic kilometer of material. The largest explosion on record was Toba, thought to have erupted 73,000 years ago. It released more than 1,000 cubic kilometers of material, and created a caldera 100 km long and 30 kilometers wide. The explosion plunged the world into a world wide ice age. Toba was considered an 8 on the VEI. That’s right, the tallest volcano in the Solar System isn’t on Earth at all, but on Mars. Olympus Mons, on Mars, is a giant shield volcano that rises to an elevation of 27 km, and it measures 550 km across. Scientists think that Olympus Mons was able to get so large because there aren’t any plate tectonics on Mars. A single hotspot was able to bubble away for billions of years, building the volcano up bigger and bigger. The tallest volcano on Earth is Hawaii’s Mauna Kea, with an elevation of 4,207 meters. It’s only a little bigger than the largest volcano on Earth, Mauna Loa with an elevation of only 4,169 meters. Both are shield volcanoes that rise up from the bottom of the ocean. If you could measure Mauna Kea from the base of the ocean to its peak, you’d get a true height of 10,203 meters (and that’s bigger than Mount Everest). You might think that the peak of Mount Everest is the most distant point from the center of the Earth, but that’s not true. Instead, it’s the volcano Chimborazo in Ecuador. That’s because the Earth is spinning in space and is flattened out. Points at the equator are further from the center of the Earth than the poles. And Chimborazo is very close to the Earth’s equator. We have written many articles about volcanoes for Universe Today. Here’s an article that tackles about the 10 facts about earth’s core. You might also want to read on the 10 facts about earth. And here’s more: all about volcanoes. MESSENGER captured this high-resolution image of an elongated pit crater within the floor of the 355-km (220-mile) -wide crater Tolstoj on Mercury on Jan. 11, 2012. The low angle of sun illumination puts the interior of the pit crater into deep shadow, making it appear bottomless. Pit craters are not caused by impacts, but rather by the collapse of the roof of an underground magma chamber. They are characterized by the lack of a rim or surrounding ejecta blankets, and are often not circular in shape. Since the floor of Tolstoj crater is thought to have once been flooded by lava, a pit crater is not out of place here. The presence of such craters on Mercury indicates past volcanic activity on Mercury contributing to the planet’s evolution. Read more on the MESSENGER mission website here.